Wild/Tame is an exhibition of disturbing yet beautifully drawn and painted contemporary POP/Surrealist works on panel, canvas and paper by Michael Caines. The small and large drawings and paintings that comprise this imagery-rich solo Art Gallery of Peterborough show are culled from the last decade of the artist’s uncanny and allegorical, animal-themed oeuvre. Several drawings are excerpted from Caines series Purgastoria. The roots of the piece are embedded in the artist’s childhood recognition of mortality, and his consequent desire to more fully explore his early perception. Caines points to epic poems – such as Dante’s Inferno or The Epic of Gilgamesh, which are rife with mythical images that describe a protagonist grappling with monsters and deities on the road to self-realization and transformation. 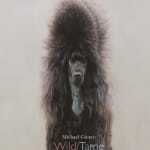 Wild/Tame also features works from Caines’ series titled El Dorado. El Dorado represents a thematic shift from Purgastoria, in that it is about love, salvation and transformation. This project is inspired by his travels in New Mexico and California and by a cowboy story written by Peterborough writer, Janette Platana, titled, How it Is, in addition to a plethora of Western movies. It is this unusual combination of iconic images gleaned from world religions, childhood and pop culture that makes Caines’ swirling landscapes — populated by funny and dark themes, so compelling.